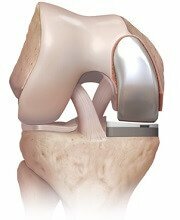 Problems after knee replacement surgery are usually fairly mild and short lived, particularly with partial knee replacements. People are usually up and around within a few days and make a quick recovery. But, with any surgery, there are risks and possible complications. Knee replacements are no exception. Here we will look at the general risks of any surgery and the specific risks and long term problems that can be associated with partial knee replacements. If you have had a total knee replacement, visit the TKR problems/risks section instead. Generally, people recover really well after partial knee replacement surgery. They are up out of bed walking around the next day and usually regain full range of movement and strength. Crutches or sticks may be needed for the first few days for some support. It may be painful for the first few days after a partial knee replacement, but people often find the knee pain is actually less severe than beforehand as they no longer have the arthritis pain. There may be persistent numbness around the scar after knee replacement. This is due to some of the small nerve fibres being disrupted during the surgery, but this is usually minor and often recovers with time. 3) Infection: usually at the site but the infection can spread around your body. Risks for anaesthesia include breathing problems and reactions to the medications. Your surgeon will discuss all of these with your prior to your surgery. If you have any questions, always ask your doctor until you are happy that you understand what exactly is involved. Recovery tends to be quicker after a partial knee replacement than after a total knee replacement as the surgery is less extensive and more of the knee is preserved such as the ligaments. 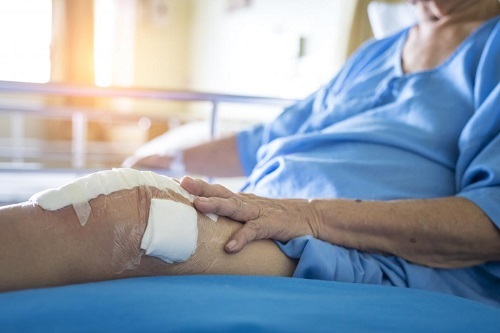 You will know if something is seriously wrong after knee replacement surgery as the knee will become very painful, it may swell, and you may notice redness around the knee joint all of which may be accompanied by a fever. If this happens you should talk to your doctor immediately.